But StockTwits users weren't as euphoric. That may be true, but for now, Urban Outfitters has managed to get itself on the turnaround train. sn0wman: the problem i have with $URBN is it's so overpriced. i know this model works, but it's just hard to believe that people spend $ at $URBN. The perfect price point is a tough thing to get right but Urban Outfitters has done a good job of managing its stock (and I don't mean Wall Street). lamonicabuzz: Hipsters unite! And buy ironic T-shirts! 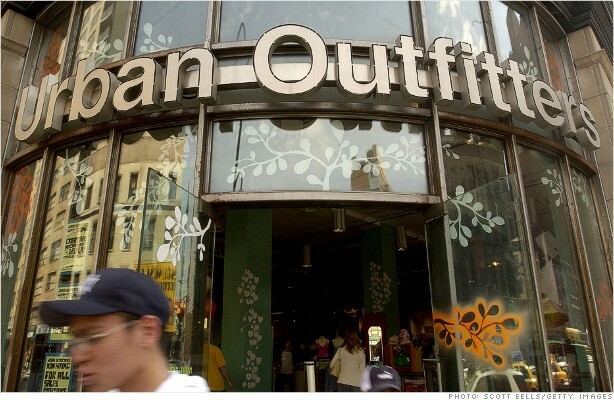 Urban Outfitters earnings and sales top forecasts.$URBN up 15% after hours. Investors continued to snap up shares of Urban Outfitters Tuesday. The stock surged nearly 18% and is up more than 30% over the past three months. Other "hip" retailers jumped on the bandwagon. Shares of Abercrombie & Fitch (ANF) and Aeropostale (ARO) rose between 1% and 3% Tuesday.